Boris Vallejo was at the height of his fame when he took on this commission for Chess King, an American retailer specializing in hip young men’s fashion, in 1986. Vallejo moved to the United States in 1964 from his native Peru to work in commercial art and pulp paperback covers in their ’60s and ’70s heyday, honing his skills painting the rippling thews of barbarian kings and the oiled curves of their female companions. He got his big break in 1977 with the poster for the cinematic re-release of Barbarella (1968), which was itself an adaptation of a French bande dessinée of the early-to-mid-60s. His film poster commissions (which gained a heady second life on VHS boxes) exploded in the 1980s, and included classics like Q: The Winged Serpent (1982) and Deathstalker (1983). Vallejo was never afraid to parodically tweak the tropes of fantasy art, as seen in his posters for both National Lampoon’s Vacation (1983) and European Vacation (1985), and, more recently, Aqua Teen Hunger Force Colon Movie Film For Theaters (2007). Chess King was founded in 1968 as a retailer featuring fashions for teenage boys and young men, right around the time that indoor shopping malls were beginning to mushroom in the suburbs of America. Its distinctive checkerboard branding (chosen because “chess and auto racing were high” on a list put together by “a research team… sent to find out what interested young men”) ended up being the perfect style for a Vans-wearing, New Wave demographic. 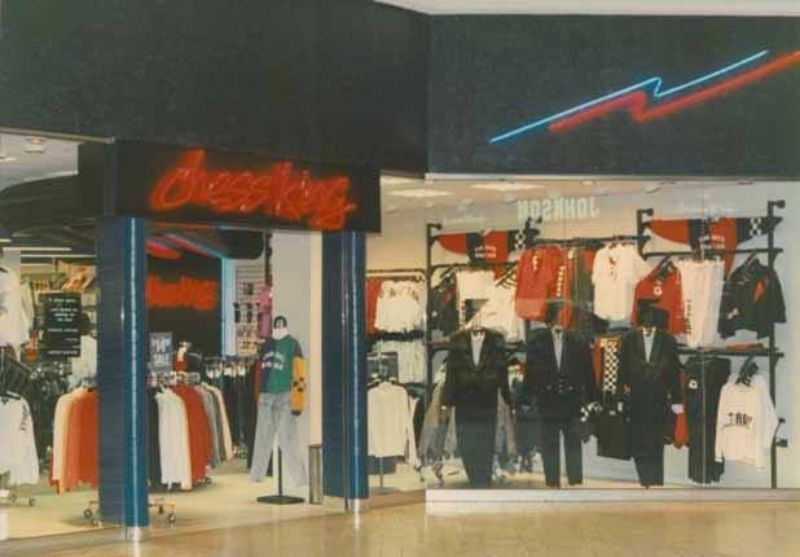 Chess King was the sine qua non clothing retailer in American shopping malls in the 1980s: its storefronts were beacons for the high schooler with generous allowances and/or after-school job money. The clothing that Chess King featured was emblematic of the age: satin finishes, casual wear made hip by choices in styling (extraneous pockets, Velcro, popped collars, overt designer branding) and color (either bright, bold contrasts, Miami Vice-influenced pastels, or, later in the decade, fluorescents). The Chess King Man was one whose breezy, informal style was carefully studied while simultaneously party to a mass marketing machine: ready-to-wear that aspired to designer status. One of Chess King’s main competitors, Merry-Go-Round, bought out Chess King in 1993 after the latter had fallen from its decadent heights. Merry-Go-Round was a unisex outlet with a slightly more aspirational line of fashions (with accordingly higher price points). In the three images above, Vallejo tries to marry his aesthetic with Chess King’s, which may seem on the surface like a very tall order! But it’s interesting to note how successfully Vallejo’s muscular Chess King model evokes both the go-go Reagan ’80s and a post-apocalyptic barbarian wasteland. The accents, courtesy of the era’s distinctive men’s fashion color palette (teal, deep red, and salmon) gives a badly-needed splash of brightness to a normally grim and murky fantasy tableau. The suspenders evoke the threadbare armor straps usually worn by Vallejo’s fantasy subjects, while the muscle shirts allow for a hint of the aforementioned glistening thews. The female subjects’ bodies and clothing adhere more closely to the fantasy-sci-fi formula, but their hairstyles (frizzy perms and dyed post-punk pompadours) are pure 1986. There’s a sense of dynamism in all of these images, especially the one featuring the sunglasses-wearing model running past the dragon while holding the lapels of his salmon blazer. What may seem like an incongruous marriage of styles on the surface actually speaks to the heart of 1980s pop culture’s love of maverick heroes, barbarian kings, and cops who don’t play by the rules.